That is the plaint of many a critic when they come across a film or book or any work of art they do not like, but which has undeniable merit, at least technically, if not in a few other measures as well. But the fact is that my opening words have little to do with most of the gripes labeled as such. While there are artworks for which the opening plaint is valid, far more often the correct plaint is good style, poor execution. Before I assail the inconsequential screenplay, let me tackle the plunder from oneself that envelops the film. That's been done by filmmakers as diverse as Carl Theodor Dreyer (Gertrud), Martin Scorsese (Gangs Of New York, The Aviator, The Departed), and Ingmar Bergman (Saraband), but the king of this malady has to be Woody Allen. Look at any of Allen's post-Golden Age (1977-1992) films, and it's clear that he steals from himself far more than he ever stole from Bergman or Federico Fellini. Sometimes it's a line, a scene, or a whole film. What is Deconstructing Harry but a déclassé Stardust Memories? And sometimes the films he makes are merely lesser rehashes, or films that are rehashes of parts of superior films. Both Match Point and Cassandra's Dream, while excellent films, are inferior to the majestic Crimes and Misdemeanors. 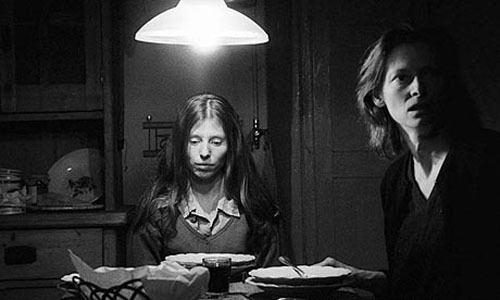 To be added to this list is Béla Tarr, for The Man from London is a good effort at best. Not unlike Nuri Bilge Ceylan's latest film, Three Monkeys, whose script is a bad soap opera, The Man from London doesn't reach a high level of accomplishment because Tarr has nothing of any depth to say on death or murder, the claimed subjects of the film. Worse yet, the filmmaker says nothing of heft likely because he has run out of visual ideas. Prior to The Man from London, I'd seen (in order) Damnation (1988), Satantango (1994), and Werckmeister Harmonies (2000); each of those only got better than the last. Given the excellent starting quality of Damnation, that's saying something. Damnation has an animal vitality that The Man from London lacks. Satantango has a daring of form and subject matter that The Man from London lacks. Werckmeister Harmonies (the best of the four films) has an emotional gravitas and narrative hold that The Man from London lacks. 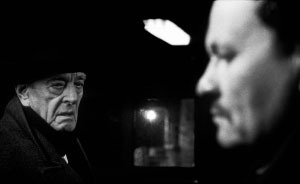 Yet, each of these films has scenes or moments that are repeated in The Man from London; the problem is that in every instance the scene or moment in the more recent film is inferior to what can be found in Tarr's earlier efforts. Sometimes that happens because The Man from London lacks the artistic daring and skill found in the earlier films, but just as often it's because it does not require such scenes. Tarr is trying to hammer a square peg into a too small round hole, thus showing that The Man from London is not borne of a Muse, but borne of roteness. Tarr is going through the motions, cobbling together a film out of habit, not vision. But more on that in a bit. From Damnation, Tarr takes the bravura opening scene of a tramway of mining buckets that recesses into the apartment of a lonely man, pulling back around him, and transmogrifies it into The Man from London's similarly constructed, multiple scenes of its lead character, the night watchman Maloin (Miroslav Krobot), gazing over the French harbor/train depot (although reportedly shot in Portugal), while having the camera pull back and forth from outside the windows to inside the room. The problem is that in the earlier film the opening shot occurs once at the film's opening, thus setting up the idea of the illusiveness of life – later recapitulated in other scenes through other methods. In The Man from London, Tarr uses the technique of gesturing in and out of Maloin's office several times, and not at the film's start. This vitiates the impact of the technique and its declaration as a de facto idée fixe for the film. Compounding matters, the repetition undercuts the power of the technique, while what occurs outside of Maloin's window is not as compelling to watch or as masterfully orchestrated as the opening in Damnation. From Satantango, Tarr does the almost inverse of what he did with the Damnation sequence, taking several great scenes of people at a bar, and invoking a similar scene in a pool hall in The Man from London. But unlike a similar single scene in Werckmeister Harmonies, which illuminates the lead character's inner self, the sequence in The Man from London plays as a sort of grotesque bit, tossed in just for shock value. In Satantango, the bar scenes play out much longer; one scene, in particular, is shown from two different perspectives at two different points in the film. This causes a parallax that is absent in the pool hall scene, which also fails to highlight anything about the main character. (The grotesques are walk-ons, and not the intimately sketched characters of Satantango.) Again, Tarr is just going through the motions. Finally, from Werckmeister Harmonies we get The Man from London's opening scene, which tracks up from the water in the harbor overseen by Maloin, and onto the docked ship the film's titular character may be aboard. The score and the almost fetishistic lingering of the camera recall the scene in the earlier film where its lead character is cosmically stirred by peering into the eye of a dead whale. But as with the bit stolen from Damnation, the sequence in The Man from London is also misplaced. The reason the whale eye in Werckmeister Harmonies is so moving is a) it is well scored, and b) we know the character, identify with him as an everyman, and can sense the import the moment will bring to him (and to us). By contrast, the scene in The Man from London opens the film, appearing before any human characters are introduced. As a result, it lacks the aforementioned point “b,” while he newer film's score is much more harsh and overdone. We, the audience, are supposed to be impressed with the ship and the cinematography, but it just plays out as Tarr blowing his own horn in a fanfare for something that does not follow later on in the film. And this touches upon another major flaw in The Man from London: the scoring by Mihály Vig. Vig's compositions in his preceding film with Tarr, Werckmeister Harmonies, was both sublime and sparely used. 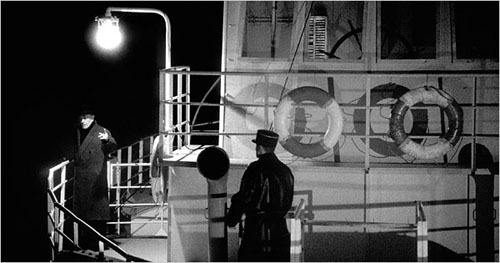 But from its opening scene, with the camera slowly trolling up the docked ship, the music in The Man from London is as heavyhanded as one of Philip Glass' bad scores – especially use of the accordion, which, while leaden and enervating, was so much more energizing in Satantango. On the other hand, Fred Kelemen's camera work is sublime, and has been rightly praised in most critical takes on the film. It's the only real positive found in The Man from London – though a monumentally great one. Now, usually I do not mind even poor dubbing as I find it far preferable to even good subtitling, but here the viewer gets the worst of both. We get poor dubbing and poor subtitling, as much is left untranslated and what is translated is in white font, often difficult to make out as it blanches against the screen. This is unacceptable, and shows Tarr's real contempt for the viewer, as well as laziness on his part. In cases like this you either get your actors to learn their roles phonetically (as he did in the far better dubbed Werckmeister Harmonies), then subtitle them (after all, none of the characters has many lines, especially Swinton, in a de facto cameo), or you bite the bullet on realism, hire all actors who can speak one language, and just 'pretend,' as they did in ye olden, golden days of film. In short, the aural elements of The Man from London – the speaking roles and scoring – are an utter disaster! The screenplay is little better. Adapting a novel by Georges Simenon, Tarr and his pal, László Krasznahorkai, have created a screenplay of jagged fragments that never cohere into a whole. It's not that the plot is confusing – as many critics claim of films they do not understand; it's merely simplistic and unbelievable. The filmmakers and the film's ad campaign have tried to make The Man from London into a film noir revolving around a murder and a cover-up. Yet, that's not what the film is about. The Man from London follows Maloin, the night watchman at a local harbor and rail yard, after he witnesses some subterfuge on a boat, followed by fisticuffs on a pier, in which one of the two combatants falls off into the water. As shown on camera, the supposed death is clearly not murder, but an accident or an act of self-defense. Maloin later goes to the pier and retrieves a suitcase full of money. Now, it's strongly implied that this is related to the docked ship where some sort of illegal transactions are transpiring. We then follow Maloin to his home, where Tarr offers some great scenes of him trying to sleep and dreaming of the prior night. We also see his protectiveness toward his daughter, Henriette (Erika Bok), and his arguments with his nameless wife (played by Swinton), who comes off as a typical harridan. All of these scenes, no matter how well filmed, feel tired and repetitive. By contrast, in Tarr's earlier Satantango, Erika Bok plays a small girl who violently wrestles with and kills her cat. Despite the ugly nature of that sequence, it elucidates both Bok's character and one of that film's major plot points and themes. No such corresponding sequence exists in The Man from London. The true sign of the film's failure, however, is that none of this arouses any empathy or desire to make sense out of the goings-on. I found it impossible to care for any of the cardboard characters, even for the dead Englishman's widow (Agi Szirtes), upon whose heartbroken face the film ends in a whiteout. Compare this to the characters in Tarr's other films and the Man from London's utter lack of complexity is stark. As for the DVD, put out by Artificial Eye in Region 2, it is subpar when compared to the usual quality of their product. The DVD subtitles and dubbing, as mentioned before, are poor, while the package comes with very skimpy extras: a mediocre interview with Tarr, who lapses between English and Hungarian. There isn't even a booklet or theatrical trailer, let alone a much-needed audio commentary. Even the DVD sleeve wrongly lists the film's time at approximately 90 minutes – which is true if 130 minutes can be considered approximate. Also irritating is scanning the reviews of the film and seeing so many critics caught cheating, yet again. I hate critical cribbing – the practice of not even engaging a work of art, but merely copying ideas or claims made by others and grafting them into one's own work. The two most egregious examples of this that stick in my craw are the claims regarding character names that simply are not so in Michelangelo Antonioni's Blow-Up and Alain Resnais' Last Year in Marienbad. That practice shows why criticism has become outdated in most cultural contexts. In The Man from London, the most repeated error is one grafted from the film's ad campaign: that there is a murder. Apparently, no critic has watched the scene of the fight on the pier, or recognized that there is no evidence of foul play in the Englishman's death. So, why repeat these fallacies? My guess is that, as film critic Ray Carney has often noted, most of what passes for film criticism is merely a variant form of a film's advertising campaign. For its part, this ties back to the idea that The Man from London is all about style over substance. Indeed, there's not much substance in this film, but had it been better executed – in terms of the mise en scène, the scoring, the screenplay (including the lack of poor self-plagiarism), etc. – the thin substance would have been a non-issue. Others have claimed that the plot 'meanders,' but this is no more or less true here than in any of Tarr's other films. That claim has no qualitative bearing on why The Man from London fails where the others succeed, often brilliantly. Meandering, in fact, is not its sin, unconnectedness is. 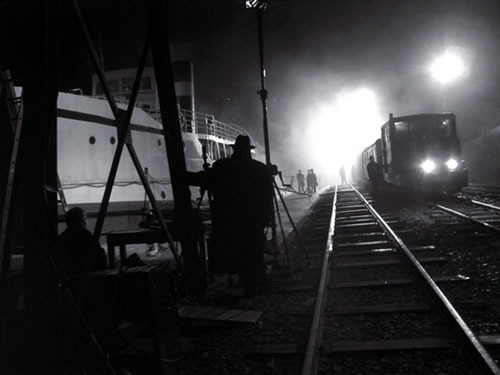 And finally, calling a black-and-white film set mostly at night a film noir does not cover up the sins of its screenplay – especially when The Man from London is not a film noir, not even by Tarrian standards. Perhaps the (failed) attempt to make a film noir so perplexed Tarr that it is the main reason for the film's flaws – but that is speculation, not criticism. Tarr is famously quoted in an interview as stating, 'I believe that you keep making the same film throughout your whole life.' The Man from London disproves that, unless one equates self-plagiarism with making the same film. Yet, as disappointing as The Man from London is, it is not the total garbage that most Hollywood films throw into the culture. It is only a 'relative' failure, from an acknowledged master of the art form; therefore, it is still a good film, and one worth watching if only to use it as grounds for comparison to Tarr's earlier – and better – films. Hopefully, Tarr will recognize this misstep and return to his better form in his next film. That's one lesson Hollywood never seems to learn. A londoni férfi / The Man from London (2007). Dir. : Béla Tarr. Scr. 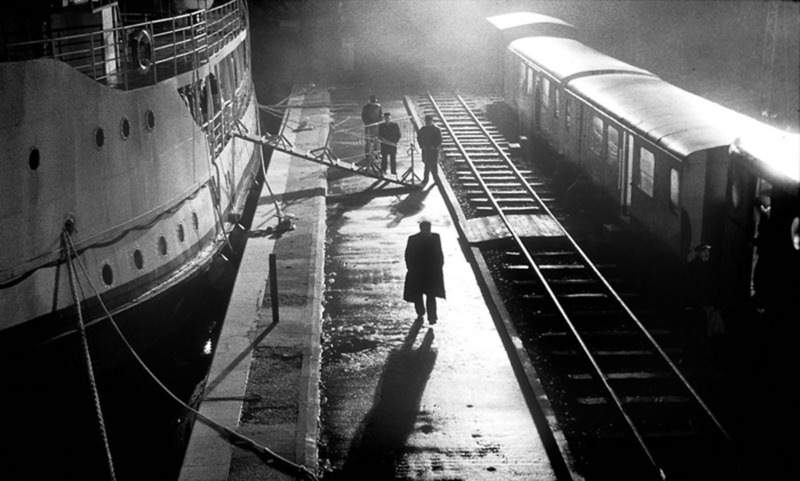 : Béla Tarr and László Krasznahorkai; from Georges Simenon's novel. Cast: Miroslav Krobot, Tilda Swinton, Ági Szirtes, János Derzsi, Erika Bók, István Lénárt. Did we see the same movie? I've always suspected its detractors are unfamiliar with the world of Georges Simenon (author of the novel L'homme de Londres). I found Tarr's film a superlative cinematic expression of that edgy world. It conveys all the Simenonian ambiguity, the moral ambivalence, the sense of fatality and futility. It conveys the sensibility of lost souls. For me, it is unnecessary to know the specific details of the two homicides-accidental, self-defense, greed, rage, irresistible impulse-it doesn't matter, because in Simenon's world a killing can involve all these elements and more, simultaneously. I love how the film throws one off balance with audio-visual anachronisms-what century are we in? (the absence of cars and gadgets says one thing, the digital bleeps of a cash register proclaim another); what place? (the antique train says Eastern Bloc; the dialogue says France. All this (and even the dubbing) seems to me the cinematic equivalent of Simenon's verbal unbalancing act. But then-I must confess, I am head over heels in love with The Man From London!